This fall I once again had the pleasure to attend a Civil War era first person immersion event at Welbourne Plantation in Middleburg, Virginia. I have come to look forward and prepare for to this event all year long and revel in each moment spent in Middleburg each October. Each event participant selects a specific historical person to portray at the four day long event. There are quite a few published diaries written by Middleburg residents during the Civil War years. 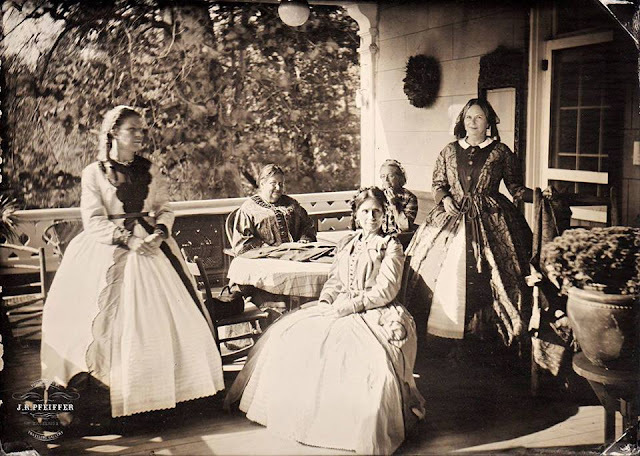 It's fascinating to read the war-time thoughts of local women and portray an 1860s Middleburg resident for a weekend. Of course, one of my favorite parts is researching and creating the clothing for my 'character'. This year the event was set in the year 1865. 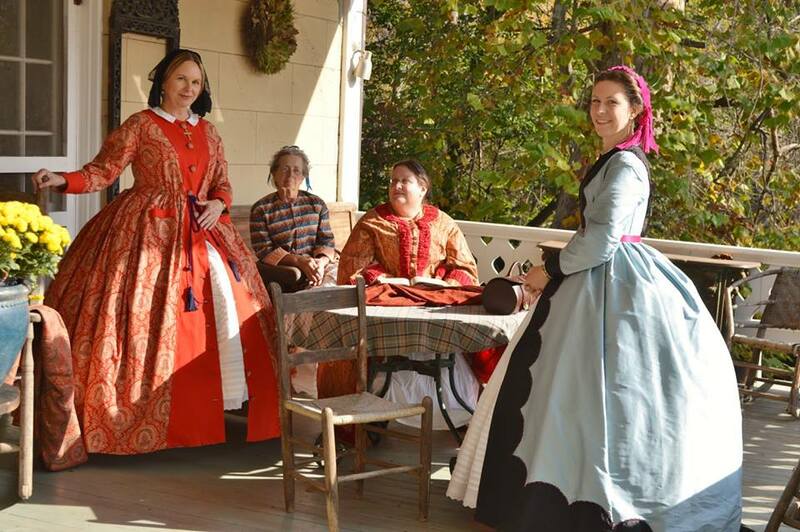 The Civil War was over and Middleburg residents were working to rebuild their lives. The real-life women that my mother and I portray had fared surprisingly well during the war. While neighbors struggled to keep shoes on their feet, their family seemed to always have enough to bless those around them with food, clothing and other supplies. Therefore, even in 1865 the wardrobes still reflected some of the wealth that the family had originally had. The first day of the event, a Friday, we had a formal breakfast in the dining room, clothed in our wrappers. Wrappers are one of my favorite Victorian articles of clothing to research because they were usually very elaborately trimmed and often made of bold colors. Above, my mother, Nancy, wears a silk wrapper based off of an original wrapper in the collection of the MET. Read more about it HERE. My wrapper was inspired by an 1860s fashion plate. Read more about it HERE. After breakfast on Saturday we had our image made by Jim Pfeiffer in our wrappers on the back porch.